I finally caved in and started watching House of Cards on Netflix. It’s a great show with great actors, writers, and directors. Kevin Spacey has won Oscars for his movie roles, yet his portrayal of the scheming Francis “Frank” Underwood is perhaps his finest accomplishment. Frank is a complex character. You want Frank to succeed even though he sometimes plays dirty. It takes a tremendous amount of acting skill to make a manipulative character likeable. He makes Frank Underwood seem like a real political figure. But every once in a while you get reminded that he’s just acting, like the season 2 episode “Chapter 19.” That’s the episode where Frank is set to throw out the ceremonial first pitch at the Camden Yards. There’s a quick scene where he is practicing in his backyard and it becomes quite obvious that Kevin Spacey has never played Little League. He throws like a girl. His form is terrible, almost as if he’s throwing with the wrong arm. It’s embarrassing to watch. It’s distracting. 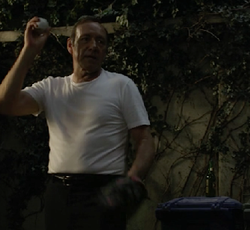 Kevin Spacey’s abysmal baseball skills cause you to lose respect for Frank Underwood and that should never happen.